The changing color of the leaves never fails to delight and surprise us. As days get shorter and shorter, the trees and plants prepare for cooler weather by slowing down photosynthesis so they can store up energy for Winter. The array of colors we see were in the leaves all along, just covered by the constant greening from photosynthesis. This is a wonderful reminder that we too have within us a pallet of untapped energy, colors that make us shine if we remove barriers of bad habits and use our energy efficiently. Another way plants respond to cooler temps is to store up their sugars. This is why carrots and leafy greens like kale get especially sweet around Autumn. Like the plants and trees, people benefit from storing energy and choosing foods that keep us nourished and warm in the fall. I love making soups, stews and chili throughout the cooler months. They can be comforting and also highly nutritious because you preserve more of the nutrients by consuming the broth that cooks them. Until it gets very cold, I still try to get a fair amount of raw (especially calciferous) vegetables which have their living enzymes in tact. However this gets more challenging in the Winter. It takes a lot of energy to digest raw foods. So one way that I ensure I still get my raw veggies in the cooler months is to make dehydrated crucifers. Kale chips are easy to make and strike a good balance between raw nutrition and comforting taste. A lot of kale chips have nuts in them, for example this wonderful cashew cheese sriracha version. So if you are looking for a lighter snack, I like to make them with alternatives. I've been playing around with winter squash and cooked sweet potato as another way to get creamy texture and sweet flavors. Recently I stumbled upon a Pumpkin kale recipe that I had to try. The original recipe can be found over at Fragrant Vanilla Cake. I made a few modifications but for the most part this is Amy's creation that I've borrowed from liberally. Break kale into bit size pieces but don't worry about massaging yet, that comes later. Put into a LARGE mixing bowl. Set up either 2 to 4 dehydrator trays with parchment paper or 2 to 4 large cookie trays with parchment if using an oven*. *(If using the oven method) set your oven to the lowest temperature possible, 150-200 deg Fahrenheit will work best. Create the "pie dressing" by putting all remaining ingredients in a high powered blender. Blend, adding only as little water as you need to help get things moving. You want a creamy thick sauce without any visible chunks. Massage the dressing into the kale by squeezing it with your hands until well incorporated. 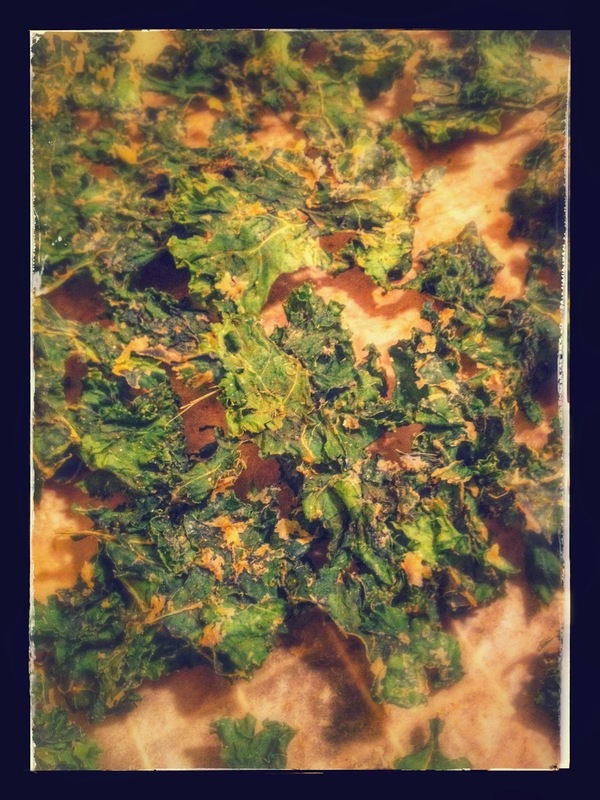 Transfer about 1/4 of the kale onto a dehydrator sheet or cookie. Either method, you want your kale fairly spaced out and an even thin layer or they won't dry properly. This is key! Repeat step 10 with remaining kale. Depending on how big your kale is, you may need more or less sheets or make it in batches. Don't overcrowd your kale! Dehydrate at 115 deg for about 8 hours or bake for 1 to 2 hours, checking the oven every 15-minutes after the first 30. I've made these with and without nuts and I actually prefer the ones without. The pear sweetened version is lighter and tastes more like pumpkin pie, while the cashew version is bit chunkier...still delicious.